I love scented candles and the way they make my house smell, but with an active infant and preschooler in the house, burning candles is sort of on the do not dare list right now, so I was pleased to be introduced to Scentsy, especially because of the special piece they've created as a fundraiser for Autism Speaks! Scentsy’s wickless candles, called warmers, make a home smell great, accent a room's décor AND provide a safe alternative to candles. This is Scentsy’s new cause warmer- Piece By Piece, to benefit Autism Speaks! The wickless candle (meaning no fire/flame/soot) has a puzzle inspired design, created to represent the mission of Autism Speaks. As you may know, since 2005 Autism Speaks has been funding global research, spreading awareness and providing hope to families whose children receive this complex diagnosis. Their mission: solving the puzzle, piece by piece. Scentsy will donate 100% off the net proceeds from the sale of this warmer ($35) directly to Autism Speaks. I was sent the Piece By Piece warmer and two great scents to try! Although I have a friend who sells Scentsy, I have never been able to make it to one of her open houses or really get to know the product, so when I was asked what scents I'd like to try, I just said something citrusy and something home baked! I got Sunkissed Citrus and Vanilla Cream to try! I started out with Vanilla Cream and fell in love! I would have kept that bar going until it ran out of scent, but in order to get this review done, I thought that I'd better try out the Sunkissed Citrus, too! I was able to melt the Vanilla Cream and put it back into it's original packaging to save for later and try out the Sunkissed Citrus scent - it is so wonderful and spring like! Checking out their online catalog, I'm amazed at how many different scents they offer - and I'm having a hard time resisting calling my friend to order one of each! 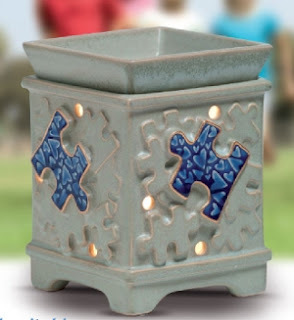 The Piece By Piece warmer itself is so adorable and the puzzle pieces are such a fun motif - whether you have a direct connection to Autism or not! If it's not for you though, they have dozens of different warmers to go with every motif! Scentsy is a direct sales company that has nearly 90,000 consultants and has grown steadily since started by husband and wife team, Orville and Heidi Thompson. If you're interested in ordering the Piece By Piece Warmer or any of their other great products you need to find a consultant or become one! One Lucky AB Reader from the US will win their own Piece By Piece warmer and scent bar. Visit Scentsy and tell me what scent you'd like to win with your warmer. "#WIN a @Scentsy Piece by Piece Warmer from @chascouponmom at Acting Balanced http://bit.ly/icrtQY #giveaway ends 4/27 #Autism Awareness"